Feeding protocols vary for every animal at The Marine Mammal Center. The type, amount, and frequency of food each animal receives varies depending on species, age, body condition, and specific medical problem. Often when an animal is first admitted to the Center, they are suffering from dehydration. To rehydrate an animal we administer an electrolyte solution either orally or subcutaneously (under the skin). Some animals require intravenous fluid therapy. Once the animal has been rehydrated, we begin the feeding regimen. Our goal is to feed young or emaciated pinnipeds (seals and sea lions) the equivalent of 10% of their body weight in whole fish (mostly herring) every day. This ensures that they are getting adequate nutrition and are putting on weight. Once an animal is healthier, we reduce the amount to a maintenance diet, which means we feed them 5% of their body weight each day. Pups are prescribed feeding regimes depending on their age and species. Pacific harbor seal pups that are not yet weaned are generally started on Zoologic (Milk Matrix 30/55) a high fat milk protein powder containing low levels of lactose and fortified with vitamins and minerals, fish oil, and water. This formula is used as a replacement for mother's milk, which can be 30 to 60% fat. Pups at this stage are fed every four hours from 8am to midnight. Northern elephant seal pups that are not yet weaned are generally started on ES Formula. The formula is comprised of Milk Matrix 30/55, water, and fish oil. Elephant seal pups are fed three to four times a day, depending on their state of nutrition. Pups that are getting formula or electrolytes are fed using a method called tube-feeding. One person restrains the animal while another inserts a soft, flexible feeding tube down the animal's esophagus and into its stomach. A volunteer then uses a large feeding syringe to deliver the formula down the tube into the animal's stomach. The entire process takes about five minutes. 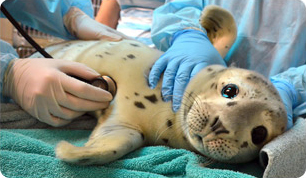 We do not bottle-feed harbor or elephant seal pups for several reasons. First, bottle-feeding increases the amount of time volunteers must spend with the animals, increasing the likelihood that an animal will bond with humans. Second, tube-feeding allows us to better monitor the amount of food each animal is receiving. Third, most harbor and elephant seal pups only nurse from their mother for twenty-eight days before being weaned. It can often take us this long just to get an animal interested in the bottle. Once pups have been stabilized and their teeth have erupted, they are offered fish. The process begins with “fish school” where volunteers initiate an animal's interest with easy to "catch" thawed frozen fish. The fish may be dragged through the pool on a string or while being held with forceps. Later the pup moves on to competing for fish with other animals and eating fish on its own, "free-feeding." Before pups are released, they must be able to forage for food on their own. One of the techniques used to ensure this is offering live fish to make certain the animal can track, catch and eat on its own. Free-feeding is how we feed most of the animals at the Center, including weaned pups, California sea lions, northern and Guadalupe fur seals, and adult harbor seals. Animals that are free-feeding are generally fed two or three times per day. During the busy seasons, volunteer animal crews may work 12 hour days in order to accommodate all of the patients' needs. Once an animal is free-feeding, we toss the fish (usually herring) into the pool and let the animal eat on its own. One important component of this free-feeding is competition with other animals. We try to keep animals together in pens so they will socialize with one another and not bond with humans, and so they will have to compete for their food just as they would in the wild.